Q: What do you charge for your services? A: All of our services are free of charge. A: We have 2 to 6 support groups each week. These support groups are for the caregiver of someone with memory issues. During most of these support groups our “Club Room” is active. Because many caregivers told us they would like to come to support group meetings but they can not leave their loved one alone, we created the “Club Room.” While you are at the support group meetings, you can bring your love one to the Club Room where there will be active, appropriate socialization for men and women with memory loss. Our Tuesday / Thursday General Support Groups are open forums, where you are free to discuss any issue you face. We have Specialized Groups, such as our Grief Group for those who have recently lost their love one. We have a Facility Issues group for those who have a love one in an Assisted Living or Skilled Nursing Home. We have a Men’s Meeting for the Male caregiver. And many more. Please see our Calendar for details. Much of our time is spent helping families on an individual basis. We pride ourselves on never turning away anyone. We have a small but knowledgeable staff who is able to help you over the phone or in person. If you are new to the Alzheimer’s Support Network we suggest that you call and set up an appointment to meet privately with our staff. This way, you get know us and we can focus on your particular concerns to best serve you. Q: If my loved one does not have Alzheimer’s can I still use your services? A: Of course. Alzheimer’s is the leading cause of dementia. But no matter what you face, we can help. Come in, and we’ll do the best we can to serve you. Q: What is the difference between Alzheimer’s and Dementia? A: Dementia is an umbrella term. It is a more general, less specific term that includes not only Alzheimer’s but many other forms of memory loss. Here is an article from the Mayo Clinic which goes into greater detail: Definition of Dementia. Q: Is the Alzheimer’s Support Network part of The Alzheimer’s Association? A: No. 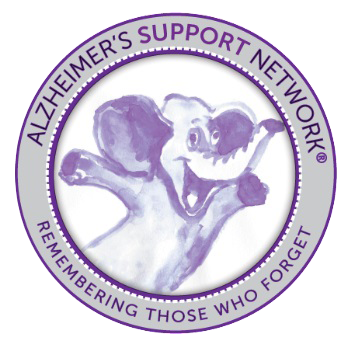 The Alzheimer’s Support Network serves Only Collier County Florida. Of course we will be happy to take your calls and help you if you live elsewhere, but we focus our efforts and resources right here in Collier County. Q: Do you Support the work of the Alzheimer’s Association? A: Yes. The Alzheimer’s Association plays a critical role in raising awareness of the disease on a national/international scale. They have great educational programs, and they help fund research. The Alzheimer’s Support Network, by contrast, is focused on providing service and support to all of you in Collier County. Q: How is the Alzheimer’s Support Network Funded? A: We exist because of donations from private individuals. Your donations keep our doors open. In addition, we have a yearly fund raiser at the Naples Zoo called Elephant Fest, through which we do receive corporate sponsorship. Q: Is my donation tax deductible? A: Yes. The Alzheimer’s Support Network is a 501(c)3 Non-Profit corporation. Your donations are tax deductible.